Adidas Adipower Weightlifting Shoe Review-Includes Video! I’m pretty sure these have got to be with maybe the exception of Nike Romaleos the most well-known shoes in weightlifting. The Adidas Adipower weightlifting shoe is highly respected for its durability, sturdiness, support and overall quality. Praised for improving performances in heavy squats and Oly lifts, these capable shoes have become a favorite of many lifters. Form-fitting PU coated leather upper and instep strap, this helps to increase the shoe durability, flexibility, and ventilation. Adidas claims to have a weightlifting engineered chassis, and the Adipows were one fo the first lifting shoes to feature the TPU heel…Fantastic heel for maximum power delivery. No weightlifting shoe is perfect, and the Adipows have few a cobwebs lurking in their design, the narrow fit being one of them, luckily the pros of this shoe far outweigh the cons and in this detailed review, we’re taking a close look at all of them. How Much do The Adidas Adi-Powers Weigh? The Adipowers are classed as a mid-weight lifting shoe, just under the weight of Asics new shoe, the Mater Lift Lite, lighter than the Romaleos 2, but slightly heavier then the Romaleos 3, so at 16.2oz the Adipows are going to be just heavy enough to give athletes the foot planted on the floor feel, which I know is important to many lifters. You will hear a lot of people saying the Adipows can be used for WOD style workouts which might be true for some, but given the weight of the shoe, heel height and stiffness, these shoes are best suited for platform lifting. 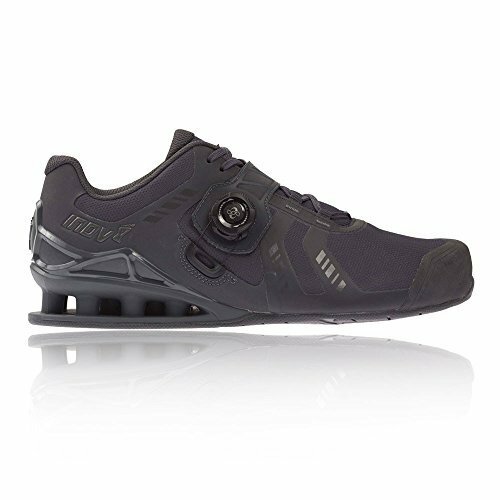 If you are after a shoe which is light, has a slightly lower heel and a higher degree of flexibility but will still offer you sufficient security, check out a pair of Inov 8 lifting shoes, great for Oly lifts and most cross-fit type workouts. The 400 BOA specifically has been designed as a lifting shoe but is light enough and flexible enough to do some WOD’s too…Fantastic shoe under a $100. Heel height should be taken very seriously and it’s not just Oly lifters and powerlifters who should be interested in shoe heel height. Bodybuilders also come into this category. If you take your bodybuilding seriously, when leg day comes you should be using a lot of squats in your workouts. Most bodybuilders tend to train in compressible heels, this is ok for the majority of exercises but when it comes to leg day a pair of dedicated lifting shoes for squats is highly recommended, why? If you squat in a shoe even with a slightly compressible heel, most of the force you intended for the weights will be lost through the compressible heel. What you need is a non-compressible heel! A heel that is optimized for propelling weight upwards and that is just what we get here from the TPU raised heel of the Adipowers. At 0.75″ the Adipows have the perfect height heel for squats and Oly lifting, and a TPU heel that will prove to be durable for many years without losing any of its power delivery. If you can afford to have a dedicated pair of shoes for leg day it will be well worth it. It is important to note that the Adipows do run a little narrow, although these shoes are rated to fit true to size, people with wider feet might want to avoid this shoe, there have been reports of toes being too squashed together of guys with wider feet. And as mentioned earlier the Adipows employ a PU leather upper which promotes a comfy snug fit, although the PU leather upper is supposed to give a lot of flexibility to the shoe, many reviewers speak of the shoe taking a few weeks to break in. Are they breathable? You have the mesh of the tongue which should aid a lot with breathability, you also have the perforated holes in the toe of the shoe this should also really help. Whilst I cannot see them being the most breathable of lifting shoes as there is no mesh on the sides of the shoes what they do have should be sufficient. If you have a two strapped shoe then yes it makes sense to have one strap at the instep and one over the lower part of the tongue for maximum security, but why bother if you’re going to design a one strap shoe placing the only strap at the instep where the laces will do most of the tightening as they have with the Adipowers. Is it not a better idea to use the strap somewhere on the shoe where it is most efficient and that in my opinion would be a medial position on a one strap design. On the flip side, ankle stability does play its part and for many lifters ankle stability is one of their biggest concerns when wearing this type of shoe, a one strap design with the strap positioned at the instep does do a very good job for extra security when holding the ankle tight. Adidas Adipower Weightlifting Shoes – Are They Worth The Money? The price of Adipowers ranges from $125 to $200 for their recently released white/silver and black pairs. Are they worth it? Yes if you want a durable shoe that lasts 3 years+, this is a serious shoe for serious lifters, guys who are competing and training most days of the week. If you’re hitting plateaus then yes these shoes will help, if you want a shoe with a high heel raise that’s stable, comfortable and great for Oly lifting, the Adipowers are worth spending that little extra. Here in the Alternatives, we’ll compare shoes of a similar price range. Adipowers do have some stiff competition from other well-known weightlifting shoe competitors and here’s two of the best. The Romaleos 3 are Nike’s new addition to their weightlifting range of shoes, they are an updated version of their previous best sellers the Romeleos 2. What are the key differences compared to the Romaleos 2? To start off with Nike decided to give the shoe a single medial strap, Romaleos 2 is a double strap shoe. They also added their flywire material, this aids flexibility whilst keeping the weight of the shoe down. What we like most about this shoe when researching it, was the option of having two different weights of the shoe, a 13 oz or 15 oz depending on which sole you use with the shoe. Both of these weights will give the shoe a nice lightweight feel. A lighter shoe will encourage faster foot movement, making it superior to its previous models because of the weight difference. The heel is made from TPU, a material chosen because of its lightweight structure and durability. Nike created a honeycomb structure for their Romaleos 3 TPU shoe heel, which helps keep the weight down even further. A 0.79″ heel height keeps this shoe in the range of the standard height used for most lifting shoes in this category. The feature that stands out most about this shoe is the use of Nike’s new lightweight material Flywire, this material is known to be strong in nature yet lightweight and flexible, the Romaleos 3 is the first shoe Nike has produced to offer this material for the upper. If you need a shoe quickly, that doesn’t need breaking in, the flywire material works well for this reason. 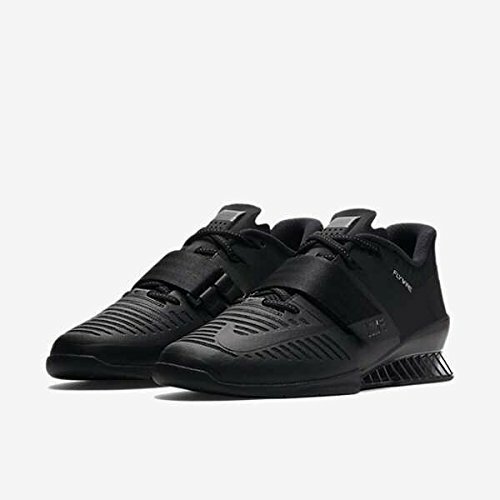 A shoe developed with hybrid workouts in mind, but still a great shoe for Oly lifters, a medial single strap will provide enough security for most but some lifters may miss the double strap tightness. A great looking shoe from Inov-8, unlike their previous FastLift models, this shoe has been specifically designed for weightlifting. To start off with, the traditional lacing system has been supplemented with the BOA, this is going to help a ton with foot security and combined with the medial strap you shouldn’t have any problems with foot movement. Their Power Truss 0.65″ heel has been designed to be lightweight, durable and non-compressible, these are typical attributes seen from TPU heels, ‘maximum power delivery, minimum weight’. Known for the traction on their outsoles Inov 8 haven’t let you down here either, the sticky rubber compound lines the outsole of the shoe. The outsole is flat which ensures a stable lifting platform, however, there are small dimples in the outsole which act like rubber suckers keeping you fully planted to the lifting platform, a design loved by many people who have purchased this lifting shoe. Just like the Romaleos 3, this shoe is light at 14 oz, the tightly woven fabric makes up the upper of the shoe, the fabric is reinforced with polythene overlays which are placed throughout the shoe, this helps give the shoe structure an added support whilst keeping it light and flexible. If you’re looking for a weightlifting shoe that can be utilized for both Oly lifts and some dynamic workouts and you haven’t got $100’s to spend, then this is a very good shoe from Inov-8, certainly worth some serious consideration. 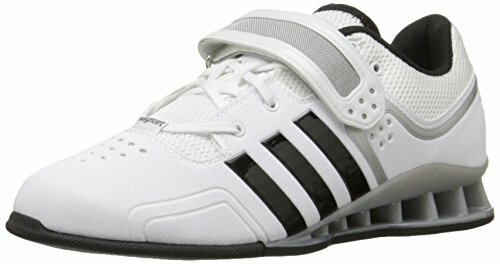 Summary Overall a fantastic weightlifting shoe from Adidas, maybe not best suited for guys with wide feet, but anyone else looking for a durable, mid-weight, lifting shoe will be impressed with its overall quality. Thank you for this great review, really helped me decide which shoes to buy for my boyfriend as Christmas present.